A reef is a bar of rock, sand, coral or similar material, lying beneath the surface of water. Many reefs result from abiotic processes (i.e. deposition of sand, wave erosion planing down rock outcrops, and other natural processes), but the best known reefs are the coral reefs of tropical waters developed through biotic processes dominated by corals and calcareous algae. Artificial reefs (e.g. shipwrecks) sometimes have a role in enhancing the physical complexity of featureless sand bottoms, in order to attract a diverse assemblage of organisms, especially algae, and fish. Earth's largest and most famous reef is the Great Barrier Reef in Australia, at a length of 2,300 kilometres. P.S. I would like to introduce my blog about improving typing skill. It introduce how to use keyblaze as a typing tutor application in order to improve your typing skill in a very short time. Typing skill is very important skill to further enhance whatever career you have since using computer is now a de facto standard. I like to mix it up a bit. Last year I gave a bag of the Tunze Reef Salt a whirl. I wasn’t overly impressed with it for the cost and, though possibly completely unrelated, I experienced a considerable increase in algae growth while using this particular salt. After finishing that bag, I planned to give it one more shot, but the shop was out of stock, so I went back to the old standby that is Instant Ocean. I’ve now been using Instant Ocean for the past 6 months or so. Reeflines.com is a new website that beautifully facilitates the tracking of your corals lineage and their growth in your tank via photos. If you have a long build thread that makes it impossible to compare growth shots or, like me, folders full of unorganized coral images that never get looked at, this may just be the tool you’ve been waiting for. Here’s a look at my Psammocora profundacella page. I took all the photos I could find of my P. profundacella, uploaded them (one by one for the time being), and now have this page dedicated to the coral. Each coral can be tagged with various info – the name of the LFS or person you acquired it from, the date acquired, and whatever else you want to remember. It is also possible to keep tabs on fragments you’ve made, and to whom they’ve been given – a feature that could be excellent for local clubs with a type of “Pay It Forward” program. On a “Black Friday” visit to Old Town Aquarium (so as to avoid having to shop with family on Michigan Ave…), I scoured over the tanks for something interesting and, not seeing anything that I had to have in the saltwater department, ended up purchasing a grip of neon tetra and a few plants for my freshwater tank that I’m also repopulating post-move. While the guy was bagging up the neons, I perused the saltwater aisle once more. The Clarion was still there, gorgeous as ever, and across the row, the tail of a pipefish was spotted hanging out of the mouth of a bubble coral. I then became entranced by a yellow Rhinopias and sat contemplating the sheer weirdness of Mother Nature. As the employee approached to ask if I needed anything else, I caught a fleeting red glimpse out of my peripheral. I assumed the half crouch middle row tank viewing stance and saw a fish I’ve been coveting since I first noticed it appearing on Live Aquaria a year or so ago – Plectranthias inermis. 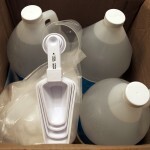 I’ve been using Reef Crystals aquarium salt for years now, and used the last of the bucket to fill up and cycle the Elos Mini. I thought it might be interesting to use a new salt mix. With the sheer selection of reef salts out there, it can be a pretty confusing choice. The aquarium salt test results from AWT, Inland Reef Aquaria, and the various salt parameters and opinions seen posted on the reef boards definitely do not make the decision any easier. After a number of months, I’ve landed back in the hobby. Not that I ever left, but a gorgeous summer combined with a move that resulted in the loss of a number of stony corals took a bit of a toll on my enthusiasm and motivation to get a new tank set up right away. The corals that made it have been chilling in a rubber maid 30gal tub, and my fish have been waiting, perhaps impatiently, in a 20 long. Over the past 4 months since we moved, I’ve been through numerous lists of equipment and about 5 tank designs (and twice that many quotes!). Having observed time and space shift conversely to the number of home projects that kept presenting themselves, I decided that the only way my animals were ever going to get out of the Rubbermaid tubs in the basement closet was to keep it simple. So, I got an ELOS mini, and the freight shipper just dropped it off yesterday. Last ‘off-season’ I was fortunate to visit the Okavango Delta, with a bit of extra time to visit Zimbabwe. This year we’ll stay a bit more domestic, spending more time in the studio & saving cash for a new home, which, obviously, includes a tank upgrade – definitely looking forward to it. And with a new home on the horizon, I’d rather not add or do anything drastic to the tank. 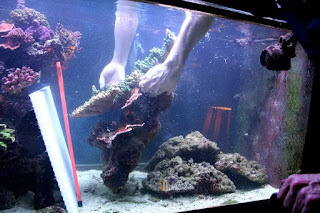 stonyreef.com The Ultimate Japanese Frag Tank? Copyright © 2018 : www.stonyreef.com ----- All rights reserved.